Stillpoint's Helichrysum Flower essence holds the energetic imprint and energy of the vibrant yellow flower. The flowers of this particular essence were collected from a Helichrysum plant that we have growing here in our garden. This particular flower essence carries the energtic imprint of the sun, hope, and healing. This is like having 911 in a bottle. 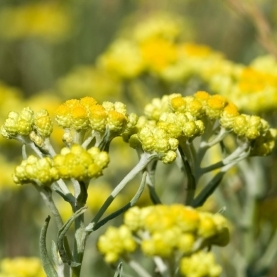 Helichrysum is often referred to as "honey for the psyche"